April is member appreciation month, and we’re excited to let you know that 2 guest passes have been added to your account for April! Bring your friends, family or coworkers in to experience everything you love about FFC. https://ffc.com/wp-content/uploads/2018/05/friends-hero.jpg 1808 2500 Megan Zink https://ffc.com/wp-content/uploads/2018/01/logo-80x80.png Megan Zink2019-04-01 17:05:472019-04-01 21:32:54All Clubs: April is Member Appreciation Month - Celebrate With These 2 Guest Passes! DIY: No equipment necessary! This ‘do it yourself’ total body conditioning class can be done anywhere. This class uses your own body weight to elevate heart rate, increase strength and endurance all in this Do It Yourself express workout (30 minutes). Twisted: take your yoga practice to the next level! If you are looking to go deeper in both mind and body, increase the effects of rotation, improve flexibility all while supporting your poses get ready to get TWISTED. Steve Parkin was born and raised in Jamaica. As a young boy of humble means, he turned to fitness as a teenager and became a regular at the local gym where he studied martial arts and bodybuilding. Steve also took up running, and was soon a competitive sprinter. He became an instructor and began sharing his passion for fitness with others. 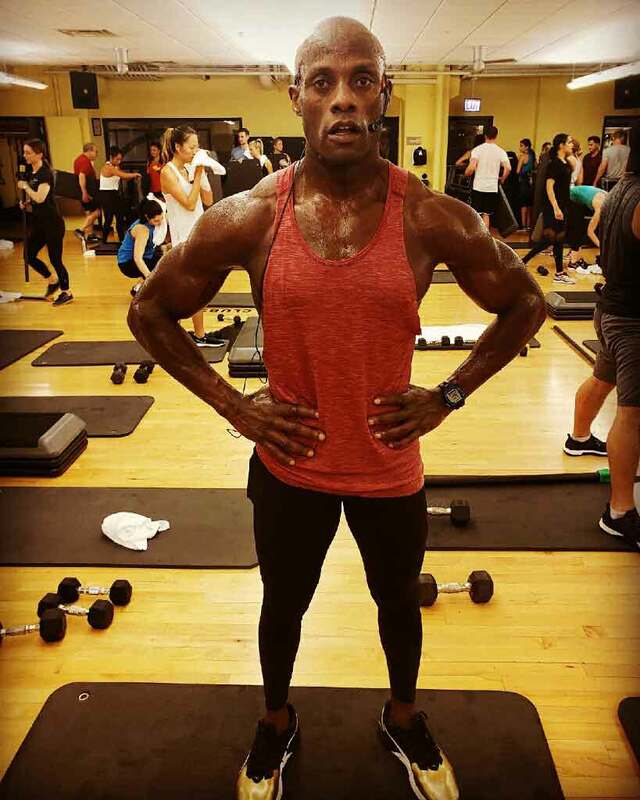 His hard work and commitment to achieving the highest level of personal fitness paid off when he was hired as a fitness instructor at a premier Jamaican resort, and asked to create a fitness program for guests. Through his work on the resort fitness program and his own personal fitness regimen, Steve realized that fitness and a healthy lifestyle had changed his life. Steve’s life goal became helping others transform their lives through fitness. After obtaining and continuing his fitness certifications in personal training and group instruction through A.F.F.A., he also held certifications with International Fitness Association, Aquatic Exercise Association, and Jamaica Aerobics & Fitness Association. Currently Steve is still teaching at FFC locations including Union Station, Gold Coast, Old Town, and West Loop where he has built a following over the past 18 years. Steve continues to adhere to his strict personal work out regimen, as well as fitness programs for his young daughters. On a personal level he enjoys spending time with his family and returning to Jamaica where it all began. https://ffc.com/wp-content/uploads/2018/05/blog-group-fitness.jpg 1398 2500 Megan Zink https://ffc.com/wp-content/uploads/2018/01/logo-80x80.png Megan Zink2019-04-01 15:54:532019-04-01 22:49:17All Clubs: Brand New Group Fitness Schedule & April Featured Instructor of the Month!! Package expires 9/30/19. No two discounts apply. Service must be received in April. No two discounts apply. Cupping is a mobilization technique used to treat pain, stiffness and swelling of the upper and lower extremities, as well as large soft tissue areas such as the shoulder blade or low back. Cupping is the combination of massage movements and negative pressure with the use of a suction device on the skin. A cup is positioned at the treatment area and a vacuum is created within the cup to draw the skin and underlying tissue into the cup. Check out FFC’s April playlist, curated by FFC spa and Ortanic airbrush technician, Alethea ‘Ale’ Brooks! Ale has worked for FFC for ten years and does Ortanic airbrush tans in the spa at West Loop. I am also a medical esthetician and health coach. I love all things fitness; yoga, lifting, running, meditating, eating healthy. I am definitely training for life. Music sets the mood for the day, the workout, and your mindset. I don’t have a go to song, but I appreciate how music can change your energy, make breathing easier, and make you workout harder. Chicago Marathon & New York Marathon Entries Available! Are you looking for a post-close guaranteed entry into the Chicago Marathon or New York City Marathon? Check out FFC’s charity partners to secure your entry into these sold-out events and receive complimentary training with support from FFC’s team of Road Runners’ Club of America (RRCA) certified Endurance Running coaches and the FFC “RunMonster” Running Club. For more info, visit teambrightpink.org or t2ea.org or contact endurance@ffc.com. We are down to the final month of the indoor triathlon & duathlon racing season! Sign up now at ffc.com/triathlon to compete for a chance to win a Chicago Triathlon race entry and call yourself a triathlete. Experienced triathletes can also compete in “the double” by racing two events back to back for a chance to compete for additional prizes. Or invite your friends or coworkers and compete for the team cup challenge! Each race entry includes a swim cap, swim goggles, and other great swag from USA Triathlon as part of the USATri60 and USADu50 duathlon national race series! Compete for age-group awards and chances to win great prizes + any beginner triathlete who signs up can also receive a complimentary swim lesson! Interested in becoming a triathlete but not yet ready? Stop by an upcoming info session or attend the Chicago Triathlon training season kickoff with FFC’s “TriMonster” triathlon club and our charity partner Team to End Aids (T2) to learn more about how you can become a triathlete, as well as raise money for a great cause! Check out fb.com/trimonsters/events for more information or contact endurance@ffc.com. Are you a triathlete or runner? Join the new “RunMonster” or “TriMonster” annual club-team to compete in our winter and summer running challenge to win prizes by logging your miles automatically using the new Zwift / Mileston bluetooth shoe pod! Are you training for a triathlon, half marathon, or marathon? Sign up for only $99/year and enjoy over $500 in perks and discounts! Learn more at ffc.com/running or contact endurance@ffc.com. Are you racing an Ironman event this year? Join fellow FFC members and our Ironman Tri Club for a training camp in Wisconsin on July 26th-28th! For more details and to sign up, visit fb.com/trimonsters/events. https://ffc.com/wp-content/uploads/2018/03/Upgrades-to-the-Endurance-Training-Center-FFC-Lincoln-Park-FFC.jpg 1000 1500 Megan Zink https://ffc.com/wp-content/uploads/2018/01/logo-80x80.png Megan Zink2019-04-01 09:45:172019-04-02 08:48:05All Clubs: FFC Endurance Spring Events & Training Roundup + Chicago Marathon/New York Marathon Entries Available! Learn new swim strokes while improving your swim technique with coached swim technique group workouts for triathletes and swimmers! Complimentary first lesson – join in anytime! Fitness Formula Clubs’ Adult Group Swim Technique classes are coached swim lessons run by our SwimMonster US Masters Swim (USMS) Club and coached by certified U.S. Masters Swim (USMS), American Swim Coaches Association (ASCA), and USA Triathlon (USAT) certified coaches. From first timers just learning to swim, to seasoned masters swimmers and Ironman triathletes, all ages and experience levels are welcome in these classes. All FFC Endurance programs are 100% intimidation-free, meaning FFC members can attend a complimentary lesson before committing to a full training program in a supportive, educational environment. Stop by the pool deck, join us for a complimentary workout, and ask our FFC endurance coaches for more information. Non-members who live in the Chicagoland area can also sign up for a free trial at ffc.com/try-tri. Questions can be directed to endurance@ffc.com. It’s your lucky month! Take advantage of these great specials at the spa during the month of March and add some spring to your step. It’s your lucky month – get ready for the season change and take advantage of our offer: two 60-minute massages for $185. Sessions expire July 31, 2019. No two discounts apply. Get your glow on for less and get ready for all those seasonal celebrations, weddings and vacations! Package expires one year from date of purchase. No two discounts apply. All Clubs: Prepare for Seasonal Running/Race Season with NovaCare Complimentary Injury Screenings & New Tools! Attention runners! Planning your next full or half marathon, or maybe thinking about your first 5k? The NovaCare Rehabilitation team can help you prevent injuries and reach your peak running potential using our state-of-the-art and innovative Run Safe Program. To learn more about this program and our passion for keeping athletes injury-free on their way to the finish line, please visit https://youtu.be/jS_AIjgJaNM. Our Run Safe App is available free on IOS and Android. Remember, if you are experiencing any pain or have sustained a recent injury, please see one of our clinicians for a complimentary injury screen during one of the times listed below in March and experience the power of physical therapy! https://ffc.com/wp-content/uploads/2018/05/NovaCare-Rehabilitation-FFC-Chicago.jpg 900 1350 Megan Zink https://ffc.com/wp-content/uploads/2018/01/logo-80x80.png Megan Zink2019-02-28 16:35:342019-02-28 16:35:34All Clubs: Prepare for Seasonal Running/Race Season with NovaCare Complimentary Injury Screenings & New Tools!